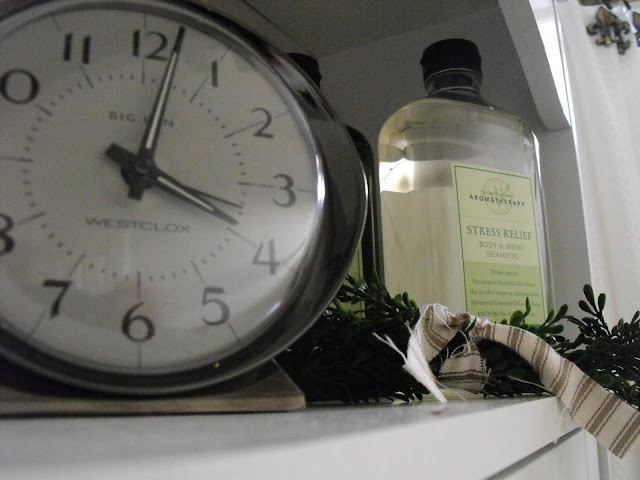 Susie Harris: Old World Style~ it's about time! Old World Style~ it's about time! This was a fun room to re-do. It went from sassy and green ..
tin holder for the paste..
because it just looked better. I really like the look in here now. I think it's the colors and textures that draw me in. Do you have a favorite "look" that you love? It didn't look too shabby before but I have to admit that the after is just fabulous! Nicely done ;). Love it all!! But my favorite is the shower sign. I love where you ultimately put the SHOWERS sign. Perfect! And I'm drooling over the ladder. I love the transformation! This is just what I want to do in my own bathroom. 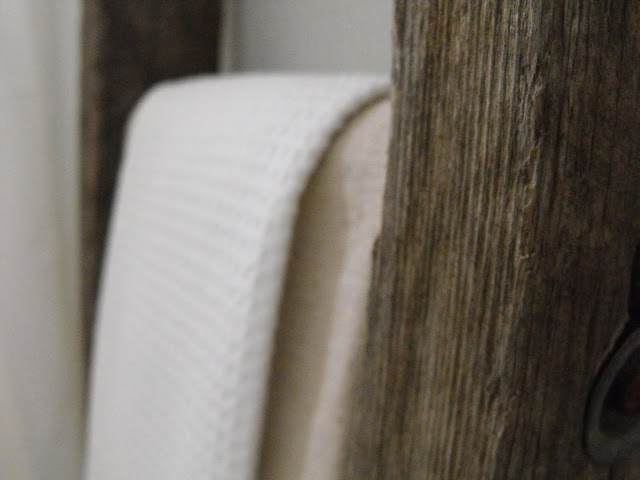 Very soft and natural. HA is the hubby even more confused now that the sign points away from the shower?? ;) It turned out perfect!! Love the ladder and wire basket too! I adore the whole room. The colors and textures make it feel so relaxing. I love the sigh over the tub. How does hubby feel about it now? Really, the whole room came together perfectly. Turned out really nice! Thanks for sharing it! I like it. Seems very calming. I especially like the "Showers" sign. Nice job! I just love it! Love the ladder, love the old locker basket, love the bright clean look...love, love love! You did a great job Susie! ME too! 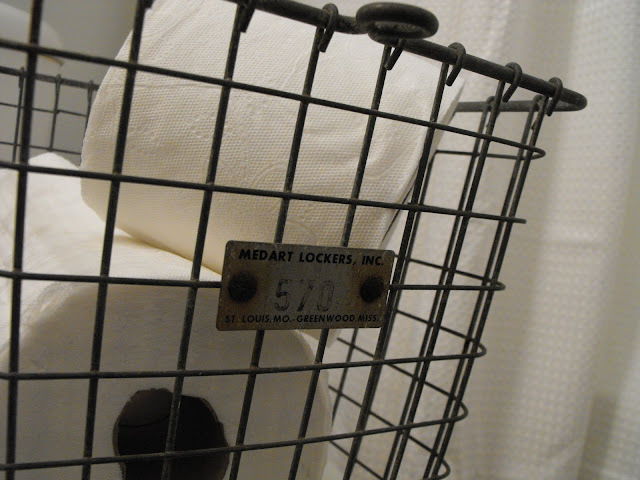 LOVE, LOVE, LOVE the metal locker basket thing. SO CUTE! 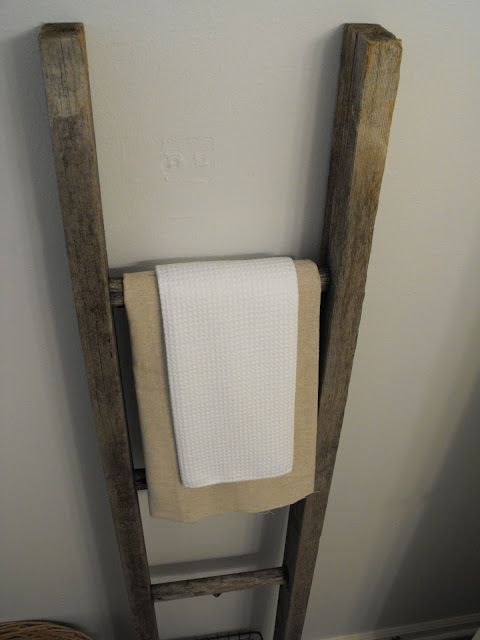 The ladder is great too and of course the new cut waffle towels! I love it! It has inspired me to once again try to do my downstairs bath. I can't seem to find the right accesories. Not sure if the colors are right in there either. I think the sign looks fab over the tub area. And I love that mirror--Home Depot, right? 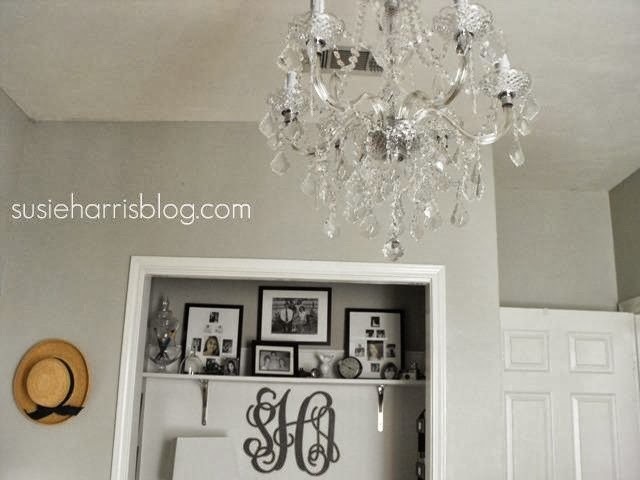 I need to update my laundry/powder room...including removing the huge Hollywood mirror and bulbs. Love that one you have. Oh Susie! I LOVE this! Criso and Clean is AWESOME! I love the shower sign, the mirror, the little soaps and that ladder!! Oh my goodness!! 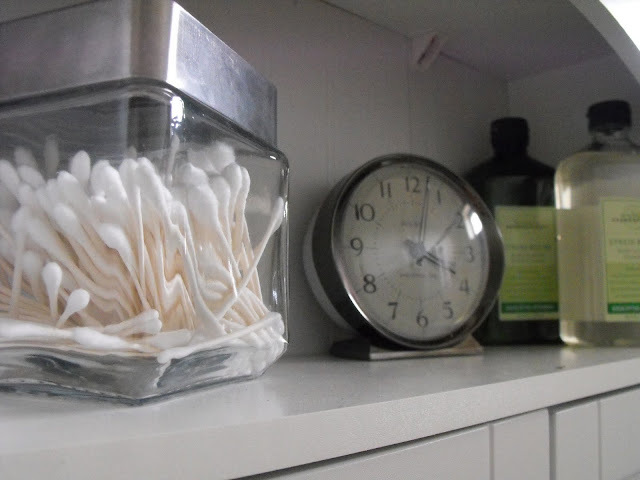 And lest I forget the sugar pourer with the bath salts in it! So cute AND practical!! You did a great job! OH! Love those monogram towels too! I love it!! So crisp and clean looking!! I had a ladder in my kids' bathroom too and it looked so cute. I got tired of hearing it crash to the floor though so I moved it out. Oh well! It looks great Susie. The sign looks great above the tub. You've been teasing us, piece by piece. Seeing it all together is a treat! Susie, I love the mix of new and old that you have in there. It looks great! Oh wow I love it so much!! Great job I love all the little touches here and there! What a fantastic re-do! You are so talented!! Love the new look - especially the ladder. It looks fabulous! I'm really loving the crips clean whites these days. If your ladder is missing tomorrow, it wasn't me. I do love that ladder though. I like the sign better over the shower also, now it is the star of the show. 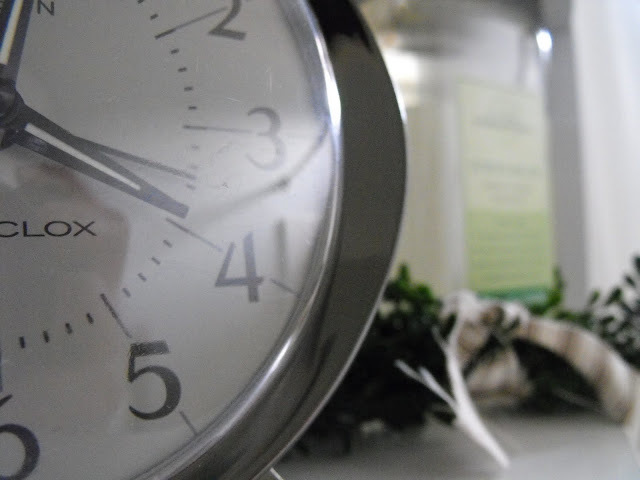 Counting down the hours until Feb. 2nd. It looked good before, but now it really looks great!!! :) It seems more open now, even though you have more accessories. More light! Two thumbs up! well...you know how i felt about the fleur de lis' getting taken out....but i have to say...MY OH MY!! i love the new look! it came together PERFECTLY!!!! way to go! 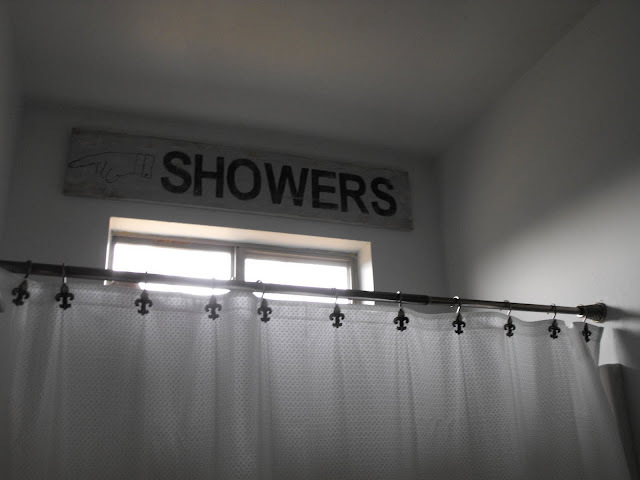 Looks great Susie- fresh, crisp and clean and I love that showers sign! Very pretty! Love the sign too. Light and bright and ready for Spring. Nice job. i love that shower sign, too cute! everything looks great - I totally love that showers sign - did you make that? O, Susie...the BEFORE was wonderful..the AFTER is AMAZING! I love every thing you did in here..the mirror over the sink is adorable but I'd have to say the SHOWERS sign is my very favorite. As you know, tho....I have a real thing for signs. O, and did you get the email about the sign I am wanting you to make for me WHEN YOU HAVE TIME ? I really love this room! 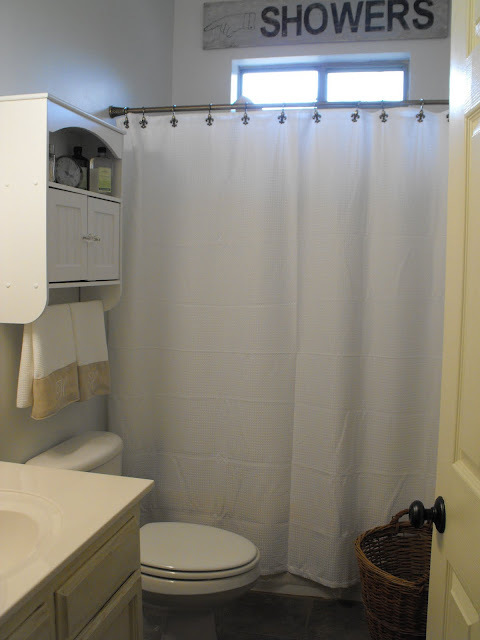 I am getting ready to redo our bathroom and cannot wait to use yours as inspiration! Thanks for sharing! I heart the shower sign!!! Love the sign over the window. A spot that most people wouldn't think of decorating! I love your room redo.Everything looks great. 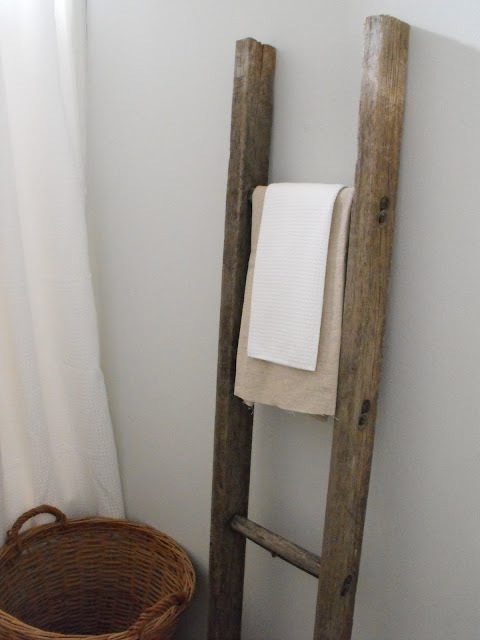 I love the idea of the ladder for the towels. Out of the ordinary and unexpected. I agree, the sign looks better over in the shower area. Beautiful makeover. Love the sign, the ladder, the clock ok ok, I love it all. Great job! You are my fav! I LOVE it! it looks awesome! 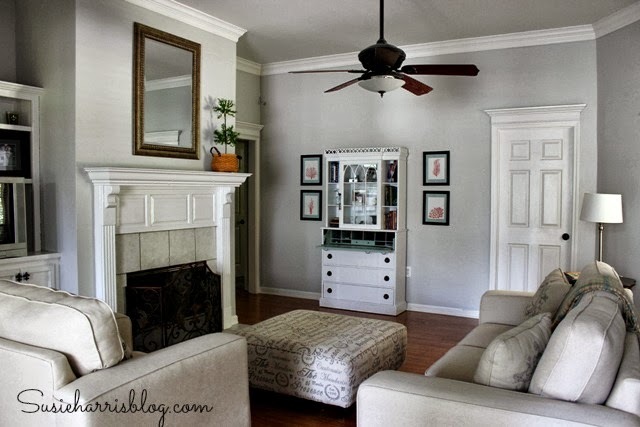 i love all the texture and the antiques mixed in with the new...so pretty! where on earth did you get those soaps? I love the way you have worked with a lot of the things you already had, and used colour, texture and just a few beautiful accessories to really change the look and feel, so I guess this probably wasn't hugely expensive to achieve? 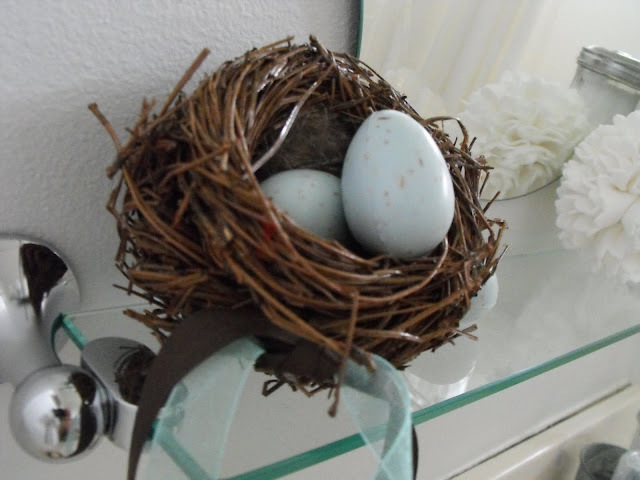 I love the robin egg soaps!! This is a fantastic "after". 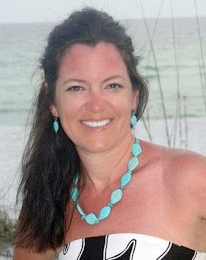 Kudos to you, Susie! Beautiful makeover. Such attention to detail. I love where you finally parked your sign! I also love how you incorporated the ladder. I featured your book sign today in my post. I LOVE every single thing in this room...right down to the little bottles of aromatherapy. It is perfection! I love how it turned out! Everything is just so beautiful. Love, love, love it! Great job, Ms. Susie, all perfectly pulled together. That could be in a magazine. Of course, I liked the green too, but this is a nice change. Great job! I like the new spot for the sign better too! I'm definitely going to be copying your towels some day. It looks beautiful Susie!! I love the sign over the window and the ladder! So pretty! 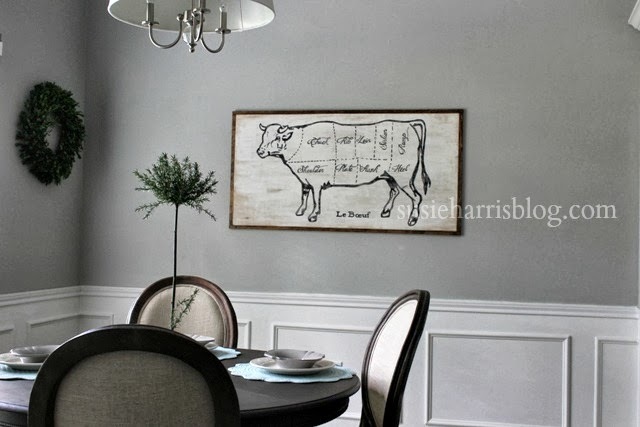 I would have to say my favorite styles are Cottage, Farmhouse, and Nordic/French Country! That's fabulous! I love the mirror shelf combo and the robin's egg soap is so cute. I love how much personality you were able to inject into it. I've been working on a face lift for our bathroom but ours is taking forEVER. How long did this take you from start to finish? Love love love it! The new mirror, the ladder, the robin's egg soaps...perfect! I love your new bathroom! I think the sign and the ladder are my favorite elements. I'm right with you on colors and textures. That and layers. I just love things that invite you to take a second look, when there's more than immediately meets the eye. Great transformation! Gives me some ideas. 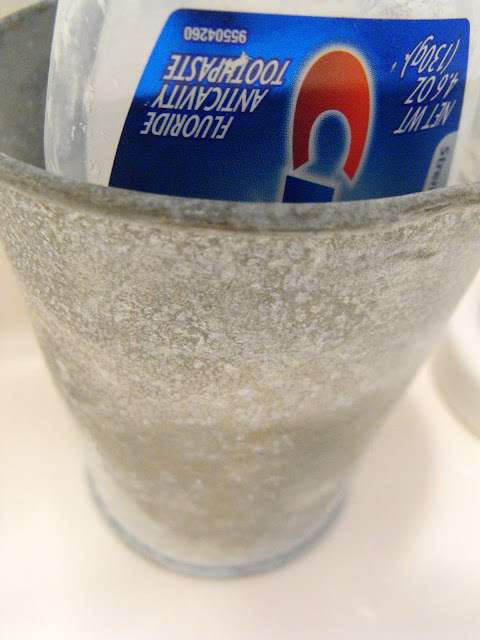 Really nice and refreshing! Would love to have that sign in my laundry room...pointing the the bathroom in there. So beaufiful and I love you sign. Great job. oh wow, I LOVE the crisp clean look!!! It looks great Susie, I'm loving the Robin egg soap!!! fab REDO. wow, just fresh and 2010! great job....especially that black board with cute message. i can see how that could turn into a fun bed time routine! I LOVE it! You did a fabulous job. It looks so crisp and inviting. What a GREAT and FRESH new look! Love it! I love all the details. You did a beautiful job of making this space even more divine. I love it!!! But that's why you have us! Men just don't get it! 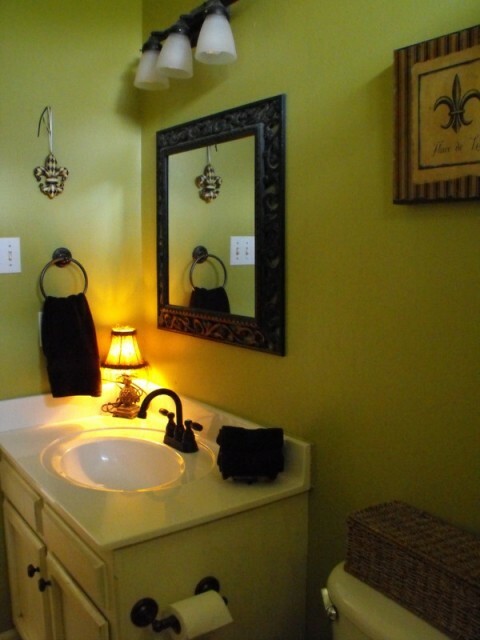 I love the bathroom makeover. 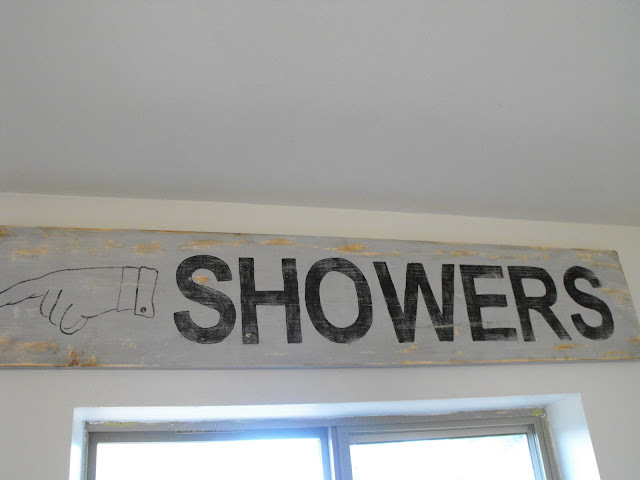 I really love the showers sign and the ladder that you use to hold towels. What a great idea. 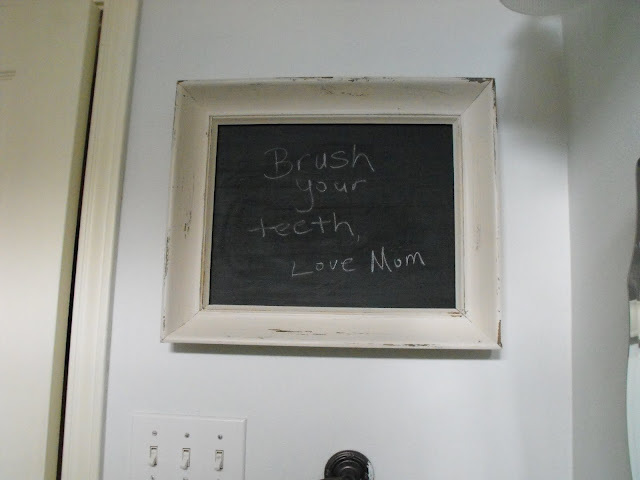 When I have kids, I would love a chalk board to leave them friendly reminders as well. Love every inch of it. Guess what?!? You won the Valentine's heart potpourri sachet giveaway on my blog! 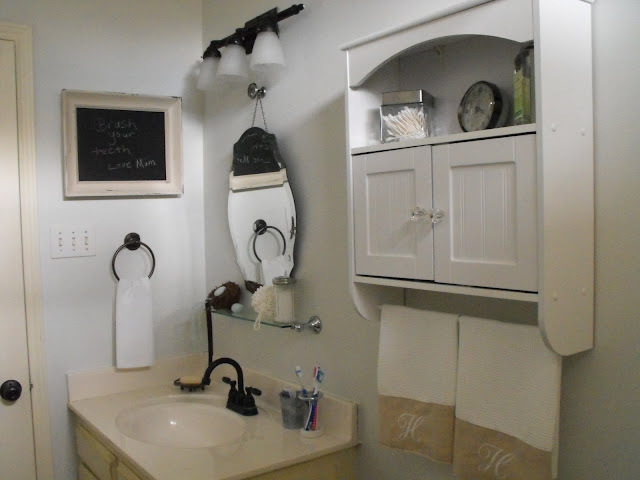 I just found your blog, your bathroom facelift is perfect! I love it, so fresh! Going back to read all about it. great job!!!! I love your style. It's fabulous! When are you coming to do mine?! LOL! Love the changes! So fresh, I love bathrooms that feel clean! Even though I am sad to see the green go - I must admit - the makeover looks great. It's all the shades of white in the accessories and textures that drew me in. Beautiful job as always. I love everything you did in this bath. It looks amazing!!!! Oh, I sigh every time I see this makeover...you did such a great job! I love the ladder! I've been wanting one, too! how lovely! it has given me some ideas for my blah kids bathroom upstairs! Did you already say where you found that mirror? that is about the same size exactly of one of our kiddo bathrooms. Great ideas to warm it up. Questions for you.....how hard is it to take down those huge builder grade mirrors that take up practically the whole wall? Love the makeover, but lOVED the sassy green too! am in love with the fleur de lis shower curtain rings!!! great job! 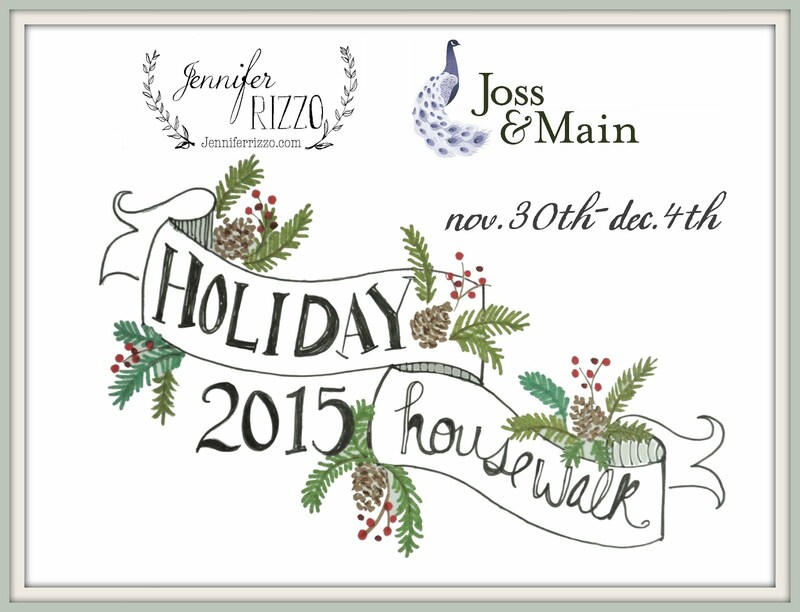 I have to say that I am so blessed to have found your blog. I have gotten so much inspiration from you just since yesterday and now I have so many projects I would like to do. I love your style. I am loving the shower curtain hooks here. I live in North Louisiana and would love some. Do you remember where you found them? Thanks so much for all your post. I will be a regular here. Are you enjoying your gifts?